The HCCA has heard our neighbors’ concerns about the increasing bear activity in the neighborhood. We are excited to share that Haw Creek has been invited to participate in the second phase of the Urban/Suburban Black Bear Study, a collaborative research project between NCSU and the NC Wildlife Resources Commission. Since 2014, the researchers have been live-trapping and GPS-radio-collaring resident black bears in Asheville to learn about urban black bear spatial ecology, movements, demography, and reproduction. If Haw Creek residents decide to participate in the study, we will provide the researchers with live-trap sites. We will also voluntarily participate in BearWise, a regional program that promotes responsible co-habitation with black bears through bear-proofing strategies. The second phase of the project provides Asheville communities with an exciting opportunity to be directly involved in wildlife research efforts, and assist in providing science-based information to create informed and effective management plans for black bears in urban/suburban areas. 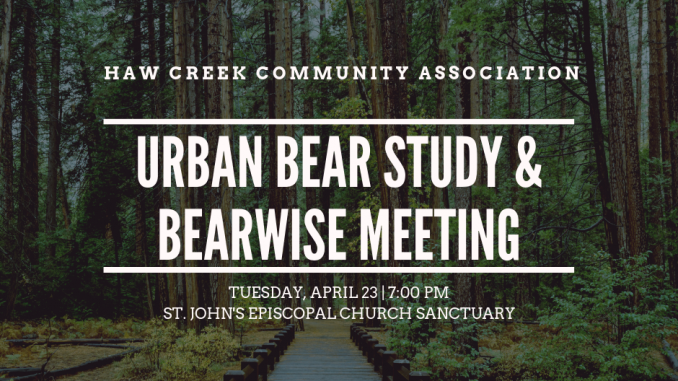 Please join the HCCA for a very important community meeting regarding our participation in the study: Black Bear Study & BearWise Community MeetingTuesday, April 23 at 7:00 pmSt. John’s Episcopal Church Sanctuary Researchers Jennifer Strules and Ashley Hobbes will help us understand what becoming BearWise-compliant entails and how individual households will participate. Participation in this study will require a high level of community cooperation, so this is our opportunity to learn more and ask questions before deciding to move forward. Please make plans now to attend this important community meeting. Click here to view the preliminary design plans. The preliminary design plans are at the 30% design stage and let you see which side of the road the sidewalk will be on. Basically, the new sidewalk starts off on the west side of New Haw Creek Road near Beverly Road and then crosses back and forth three more times so as to avoid steep and narrow areas, eventually ending at Bell Road/Charlie Bullman Park. The design plans call for installing curb and gutter along one side of the existing roadway, adding a 6′ wide sidewalk behind the new curb and gutter, and providing ADA ramps as needed. This design will look similar to the prior section of sidewalk along New Haw Creek Road between Arco Road and Beverly Road. The City of Asheville expects the design plans to be finished toward the end of this calendar year. After that, the timeline for construction depends on a number of things, such as Right-Of-Way and easement acquisition as well as obtaining a successful bidder. Once construction begins, a preliminary estimate for completion is approximately 15 months. If the sidewalk does not fit in existing Right-Of-Way (public-owned / maintained property), then the City will have to acquire Right-Of-Way from the affected neighbors to cover the new sidewalk. The City will also likely need Temporary Construction Easements. These allow access room to build the sidewalk but go away after construction is completed.